The domestic and international positioning of the Riviera Nayarit as a tourism destination, the integration of one of Mexico’s most recognized hotel and motel associations and the representation of 93% of the hotel offer of Banderas Bay give evidence to their labor of coordinating the efforts of a good team. 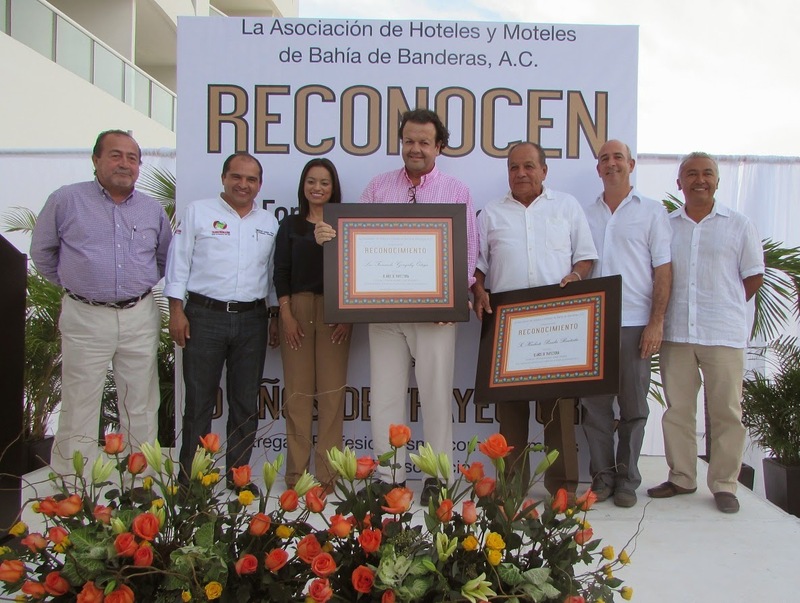 The moment was totally unexpected: after a meeting of the Banderas Bay Hotel and Motel Association (AHMBB by its acronym in Spanish), the hoteliers of the Riviera Nayarit presented President Fernando González and Treasurer Heriberto Pineda Bautista with well-deserved recognitions for their impressive careers. Both honorees were surprised and pleased with this acknowledgement. Their outstanding leadership of the AHMBB has generated great results, and their excellent coordination of the efforts of a good team has ratified their positions. “This is a recognition that belongs to more than one person and I’m not going for false modesty here,” said Fernando González. “This is for an entire team, as well as for the people who have been a part of it and are no longer here, hotelier friends who have been a part of this association.” On his part, Heriberto Pineda was grateful and stated his desire to continue reaping accomplishments for many years to come. The committee included the presence of Catalina Ruiz, Tourism Secretary for Nayarit; José Gómez, Mayor of Banderas Bay; Abel Santos, VP of the AHMBB; and Marc Murphy, Managing Director of the Riviera Nayarit Convention and Visitors Bureau (CVB). “Congratulations on your acknowledgment, which is undoubtedly a vote of confidence towards the team from those who trust in your good administration and your extraordinary passion for managing the social development of our state,” said Catalina Ruiz. “We have to recognize those who have worked for so many years to make the Riviera Nayarit what it is today. What everyone wants is a great destination and when the captain is good, the boat will certainly sail into a good port,” said José Gómez. “There’s no doubt that an important part of the success of this association is its trust in a very strong team, meaning the CVB. We now have 17 people whose thoughts revolve every day around how they can best work for the destination,” commented González Ortega. This welcome event took place at the Dreams Villamagna to the tune of mariachi music, and was attended by Celso Humberto Delgado and Nacho Cadena, as well as other members of the AHMBB, one of whom—Jesús Carmona—served as emcee.